My name is Arthur Mullen and my cat’s name is Roly Poly. I’m in my mid-30’s and have been playing Quake 2 my entire adult life. In the past few years, I began to ask more questions about how this vast game world came to be built, and began learning the stories of the clans, modders, mappers, coders, skinners and all who collaborated on the early internet of the late 90’s. I saw that was the period when women gamers were joining the deathmatch, and the birth of e-sports in the first pro gaming tournaments. These are all stories worth remembering, informing us of who we are by way of where we came from, and inspiring us to be the best, not only the best gamers, but the best human beings. For more than the past year, I have been using the Internet Archive to collect a huge amount of original content from the Quake 2 period, the late 90’s, and reposted it on my WordPress blog. Now I am excited to bring that content to life in YouTube videos. I am creating one video every week. Each will be approximately 20 minutes in length. 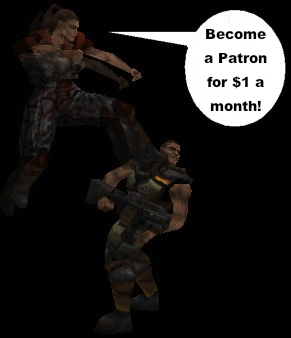 Patreon is way for fans of what I’m doing to show their support, by pledging a dollar amount for every Quake 2 gaming history video released. Thank you for believing in me and please know that I would consider accepting your money a sacred honor, and I promise to produce my best creative work of my life. Thank you guys for even considering doing such a thing by watching this video so far. Just so everybody please knows, I am asking only from those who would not be burdened by supporting me in this project. If you love Quake 2 and gaming history, but are not in a good place with money, there are a lot of others ways to show support for this thing, and I appreciate all the contributions from everybody. Thank you for the positive comments to keep me motivated. Thank you for the critical and constructive feedback to make this better in all ways. And please consider the possibility of sharing your Quake 2 story, maybe in an interview, as together we explore late 90’s gaming history, one Quake 2 story at a time.